COMMENT: ABC find in our favour on our complaint "Facts toasted in reporting Rio Roast" . So bad was the error that it appears that, in the tradition of Orwell's 1984, the offending story has been purged from the ABC website. Thank you for your email of 11 February concerning the ABC News Online story “32 killed as heatwave roasts Rio”, published that day. In line with ABC complaints procedures, your concerns have been investigated by Audience and Consumer Affairs, a unit independent of content making areas within the ABC. I regret the delay in responding. I should first explain that partner news agency stories, such as this story from AFP, are not “secondary sources” for the purposes of the ABC’s Editorial Policies. Instead, such content is presented as an ABC News story and is required to meet the editorial requirement for accuracy in news and current affairs content, as outlined in section 5.2.2(c) of the ABC’s Editorial Policies: http://www.abc.net.au/corp/pubs/edpols.htm. Accordingly, in light of your concerns, we have assessed the story against this requirement. On review, Audience and Consumer Affairs agree that the headline of the story gave the misleading impression that the 32 deaths occurred in Rio de Janeiro. As stated in the story, the 32 deaths occurred in Santos, a city 350 kilometres south of Rio. I also understand that ABC News has been advised by AFP that the temperature data for Rio cited in the story was incorrect, and AFP are in the process of circulating an amended story. 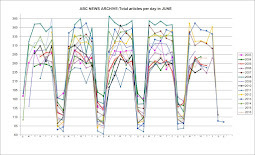 Accordingly, Audience and Consumer Affairs have found the story to be in breach of the ABC’s editorial standards for accuracy in respect to both the headline and the temperature data for Rio de Janeiro. ABC News regrets these lapses in editorial standards and is in the process of removing the story from the ABC’s website. In respect to your concerns that the story claimed the heatwave was the worst in 50 years, Audience and Consumer Affairs note that this was not presented as a statement of fact but attributed to officials. The article subsequently makes clear that the comments are from meteorologist Giovanni Dolif, who claimed the heatwave was “historic” and Rio was experiencing the hottest month in 50 years. Comments from third parties reported as an attributed viewpoint are not considered factual content for the purposes of the ABC’s Editorial Policies, nor do they represent the editorial opinion of the ABC. Accordingly, we are satisfied this aspect of the story was consistent with the ABC’s editorial standards. You also raise concerns about the story not mentioning that the 32 people who died as a result of the heatwave had pre-existing medical conditions. The story made clear that those who died were elderly, a factor that increases risk in hot conditions. Audience and Consumer Affairs believe it is not necessary to detail their medical history, and consider the descriptor of the deceased as “elderly” provided sufficient context to convey they were in an at-risk category. Accordingly, we believe the story’s reporting of the deaths in Santos was in keeping with the ABC’s editorial requirement for accuracy. We appreciate you bringing this matter to our attention, and wish to assure you that your comments have been conveyed to ABC News management. For your reference, a copy of the ABC Code of Practice is available at: http://www.abc.net.au/corp/pubs/documents/200806_codeofpractice-revised_2008.pdf. Lateline: unsceptical journalism in action? Shen Neng 1 - How significant the damage? Shen Neng 1 - How much oil? From the vault - any Catholics left at the ABC?